Ravi Varma was born in Kilimanoor Palace, Thiruvananthapuram on April 29, 1848. His first Guru (instructor) was his uncle Rajaraja Varma. In those days, painting instruction was given to students by making them draw figures on the flattened ground using quicklime. Only after that were they taught to draw on paper with pencil. In those days it was not easy to obtain paints from the market. Painters used to make colours from plants and flowers. The child prodigy Ravi Varma who began training in the traditional style came to Thiruvananthapuram in the year 1862 along with his uncle Rajaraja Varma to visit AyilyamThirunal Maharaja. The Maharaja instructed him to stay in Thiruvananthapuram to study painting. Ravi Varma was thus able to study the paintings in the palace drawn in the Italian Renaissance style, and also learn the painting techniques and styles of painters from Tamil Nadu who were among the courtiers. 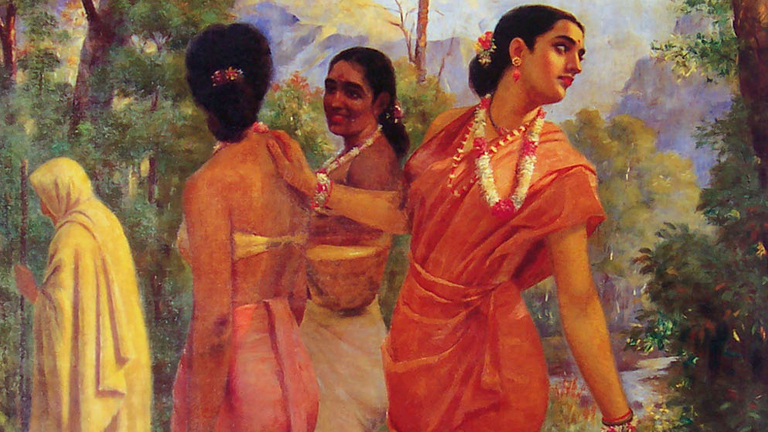 Ravi Varma studied the western style of painting, and oil painting technique from Theodore Jenson, the Dutch painter who visited Trivandrum palace in 1868. Ravi Varma painted the pictures of the Maharaja and the royal family members in the new style. His fame began to rise with his painting “Mullappoo Choodiya Nair Sthree” securing the first prize in a painting exhibition held at Chennai in 1873. This painting was awarded a prize in another exhibition held at Vienna in Austria. “Tamizh Mahilayude Sangeethalapanam,” a painting he drew in 1874 again received a prize in Chennai. This painting is now displayed at Sri Chitra Art Gallery in Thiruvananthapuram titled “Daridryam” (Poverty). In 1876, his painting of Shakunthala received a prize at the exhibition held in Chennai. This beautiful pictorial interpretation of a moment in Kalidasa’s Abhijnana Shakuntalam, when Shakunthala turns back to glance at Dushyanthan in the pretext of drawing a thorn from her feet, is one of the most famous renderings of Raja Ravi Varma. This painting was used on the front cover of the Shakuntalam translation published by Monien Williams, the British orientalist. Ravi Varma was acquainted with Sir T. Madhava Rao who was the Diwan of Travancore. Madhava Rao was functioning as the adviser of the Maharaja of Vadodara (Baroda). When he visited Thiruvananthapuram in 1880, he bought some paintings of Ravi Varma to take back with him to Baroda. That was the beginning of the huge role played by the royal family of Baroda in shaping the artistic career of Ravi Varma in later years. The largest private collection of Ravi Varma paintings is still with the Baroda royal family. In 1881, when Sayajirao Gaekwad became the Maharaja of Baroda, Ravi Varma was invited to participate in the coronation ceremony. He went to Baroda along with his brother Rajaraja Varma and stayed in Baroda for four months, and during that time he painted many pictures based on different contexts from the Puranas. In 1885, the Maharaja of Mysore ChamarajendraWodeyar invited him and requested him to paint pictures. He also travelled widely in North India. Ten of his paintings were exhibited at a world exhibition held in 1893 at Chicago in the United States. It was when he received widespread acclaim across India as a painter, Raja Ravi Varma wished to make prints of his paintings and make them accessible to all at an affordable price. His decision to link the art of painting to modern technology marked the beginning of a new chapter in the history of Indian painting. In 1894, he established a colour Oleographic Press in Mumbai and started printing affordable copies of his paintings. He had to close down the press when plague broke out in Mumbai and Pune in 1897. Finally, on January 21, 1901 he had to sell off the press and the publishing rights of more than eighty of his paintings at a low price. The Maharajas of India and the British authorities were all very eager to have Ravi Varma paint for them. The Maharaja of Udaipur, Rajasthan invited him over to paint his ancestors’ portraits. Among these, the portrait of Maharana Prathap is a masterpiece. In 1904, Ravi Varma was given the responsibility of painting the portrait of the then British governor, Arthur Havlock. In the same year, the British government honoured him by bestowing the title of “Kesar – i- Hind.” That was the first time an artist was receiving such a high honour. Ravi Varma’s important Purana paintings include Hamsadamayanti, Seethaswayamvaram, Seethabhoopravesham, Srirama Pattabhishekam, Viswamitra and Menaka, the birth of Sri Krishna, Radhamadhavam, Arjunan and Subhadra. He created many other famous paintings including Snanam Kazhinja Sthree, Narthaki, Vidyarthi, Saraswathi, Draupadi in Virata Rajadhani, the musicians of India, AchanItaa Varunnu, Udaipur Kottaram, Bhadan, Lakshmi, Yasodayum Krishnanum, and Kadambari among others. Towards the end of his life, he returned to Kilimanoor and immersed himself in a highly productive creative life. This Lord of Painting passed away on October 2, 1906. Ravi Varma’s paintings are available in many private collections all over India and at Sri Chitra Art Gallery, Thiruvananthapuram. These are also part of the collections at the National Gallery of Modern Art and other museums.